Revenue up 16.6% in first six months with after-tax profit down 21%. 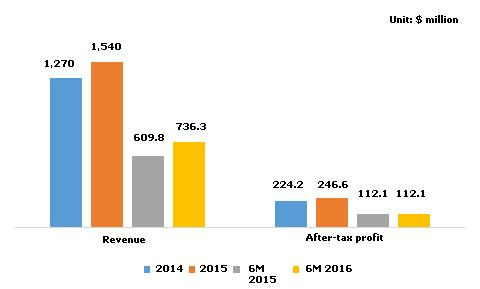 MobiFone announced revenue for the first six months of 2016 of VND16.2 trillion ($736.3 million), up 16.6 per cent year-on-year, while after-tax profit was VND2.51 trillion ($112.1 million), down 21 per cent. The telecoms provider plans to earn VND33.1 trillion ($1.48 billion) in revenue and VND4.16 trillion ($186.5 million) in after-tax profit for the year as a whole and to contribute VND4.6 trillion ($206.2 million) to the State budget. Revenue last year totaled VND31.4 trillion ($1.4 billion), or 105.4 per cent of its annual target, while after-tax profit was VND5.5 trillion ($246.6 million), or 101.5 per cent of the target. It also contributed VND7.3 trillion ($327.3 million) to the State budget. Total capital stood at VND23.2 trillion ($1 billion) in the first six months, with debts at VND7 trillion ($313.9 million), including short-term debts of VND6.5 trillion ($291.5 million). Its long-term finance was VND9.4 trillion ($421.5 million) as at June 30, 2016, against VND641.9 million ($287.8 million) in 2015. Development investment for this year is estimated at VND8.5 trillion ($381.1 million), nearly four-fold higher than the VND2.4 trillion ($107.6 million) last year. In the 2016-2020 period the company will expand into other fields and become a multi-service provider with four key components: mobile, distribution and retail, television, and multi-services. Earlier this year it purchased 95 per cent of the Audio Visual Global JSC (AVG), the operator of digital TV channel AnVien TV. AVG entered Vietnam’s pay TV sector in late 2011 but is considered the worst-performing player in the industry. Vietnam currently has some 9.9 million pay TV subscribers, but only 400,000 are AVG customers. It re-branded AnVien TV as MobiTV, hoping it would be a catalyst for the company to gain a greater market share and higher competitiveness in the communications sector after its long-awaited IPO. In August, Deputy Prime Minister Truong Hoa Binh assigned the Government Inspectorate to work with relevant agencies to conduct an inspection into the AVG deal, with sanctions available under law if any legal violations are uncovered. No reason for the inspection has been given but three questions have been posed relating to the deal: its value, the transaction method (cash payment or share swap), and why MobiFone chose AVG, given its subscriber numbers are the lowest among the three satellite TV providers in Vietnam - VTC, VSTV and AVG. Deputy Inspector General Ngo Van Khanh said at the quarterly press conference on October 27, the inspection lengthens 50 days starting from the announcement (on September 6). The inspection is going to be completed and the investigation team is implementing relevant appraisals.